This article may contain outdated information that is inaccurate for the current version of the game. It was last updated for 1.7. Zones allow you to decide where houses, shops and factories will be built. When an empty zone is assigned a zone type, buildings will be built there automatically over time (assuming people want to live or do business there!). Residential – Residential zones provide housing for people. Commercial – Commercial zones will have shops and other services selling the goods produced in the industrial zones and/or imported. Industrial – Industrial zones provide jobs for people and products for commercial buildings. They can be specialized to take advantage of natural resources. Office – Office zones provide pollution free jobs for higher tech level citizens, but it doesn't produce any goods. Zonable areas will be visible when using the zoning tools, divided into small 8×8 m squares. Areas up to four tiles from a road can be zoned. Zoning costs nothing of itself, however these roads and other services that buildings require are not inexpensive. On the other hand, the residents and businesses that occupy these buildings pay taxes, which is the principal source of income to the city's treasury. Buildings that develop in zones, known as "growables", come in a variety of sizes, however the front of all buildings must be immediately adjacent to the road. One cannot directly build growable buildings. Mayors need to make these zones attractive enough for residents and businesses to move in (and stay). If the occupants of a building are doing well, it will level up. Levelled-up employment buildings provide more numerous and better quality jobs, and levelled-up residential buildings have more numerous and more wealthy inhabitants. 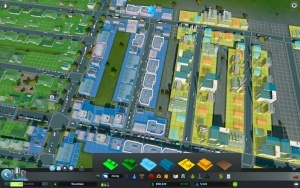 At the start of the game, only low density residential, low density commercial and industrial zones will be available to the player. The other zone types are unlocked at early milestones. Residential zones can be specialized into Self-Sufficient Buildings. Commercial zones can be specialized into Leisure, Tourism and Organic and Local Produce. Industry can be specialized into Oil, Ore, Forest and Fertile land. Office can be specialized into IT Cluster. For residential zoning, low or high density will influence but not determine the eventual occupant. Low density have a higher probability for families but also can attract elderly or students (80/20). High density will have a higher probability for students but also attracts families in a 50/50 proportion. The density also influences the way the citizens travel: residents of low density housing have a higher affinity for using cars or bikes, while high density residents prefer public transport. One thing to note is that High Density building generally cause higher traffic, and cause congestion on small roads. If your looking to build a massive city, and not crammed into one space, use low density, as it needs less services, and takes up a larger space than the high density. Note that industries and commercial zones contribute to traffic congestion, especially if goods must be imported from outside the town due to a lack of local industrial zones. Importing goods does not affect the revenue of these industries, but does affect gameplay by requiring a well-developed roadway grid. Highways have—for the moment—a limited goods import capacity, thus requiring the player to build ports and railways to import enough goods for a city. In general, stoplight-controlled intersections cannot manage enough heavy traffic to sustain an entire city, so well-planned interchanges and roundabouts are necessary for heavy import practices. Low Density Residential Zones This type of residential zone attracts families to your city. Usually two adults will start off and they will create a family. This zone takes up more space and it houses fewer people than the high density residential zone. High Density Residential Zones This type of residential zone attracts young people to your city. However, they are not inspired to procreate to help increase the population. This zone can house more people in an area than the low density residential zone. Low Density Commercial Zones These zones buy products from industrial zones (or import them) and sell them to the people. They usually require workers with little to no education and they serve fewer people than the higher density zone. Moderately noisy. High Density Commercial Zones A ramped-up version of the low density zones. Taller, noisier buildings will buy and sell more goods than the low density equivalent. These create more jobs, generally with higher educational requirements. Industrial Zones These zones manufacture goods which can be sold in commercial zones or exported. They predominantly employ workers with low education levels on low levels. Most industry produces a lot of pollution. Industrial and office zones do not have separate density classes. Specialized industry can be created by painting a district and selecting a specialist industry type for that district. Office Zones These zones exist mainly to provide jobs. They require more educated workers than industry but produce no goods. Office zones produce no pollution. In terms of the supply chain, industry and commerce produce and sell goods respectively, whilst residents are employees and consumers for this process. Office zones do not directly contribute to the supply chain, however they provide pollution-free and traffic-light employment for cims who can then spend their wages in patronizing your city's commercial zones. Households: Each residential building hold one or more households, which are families of cims that make up the inhabitants of your city. Each household includes up to two workers and one or more children. As the level of a residential building rises, so does the number of households that can live in it; and High Density Residential buildings contain approximately four times as many households as their Low Density Residential counterparts. It doesn't really matter how a residential zone develops into differently-sized buildings. As long as all of the available tiles are used, the total number of households will more or less average out to what it should be according to the table below. To add new buildings to your city, you first need to build a road which allows zoning next to it. After the road is built, you can select the zoning tool and pick the desired zone type from the available zones. There are four basic tools for zoning: fill, marquee, and brush. Fill – The fill tool allows you to assign zones to complete areas. Marquee – With the marquee tool, you can draw a square shaped area, and all zone cells within that area will be assigned to the selected zone type. Brush (two sizes) – Brush tools allow zoning by “coloring” the empty cell with the brush tool. It is recommended that the player paints zones in small blocks close to a power source rather than zoning a large area with the marquee tool, this will prevent buildings being isolated from the main power grid for an extended period of time. Assigned zones can be reverted to empty zones by de-zoning them. De-zoning is done by using the ”de-zoning” zone type from the zone options in the Zoning panel, or by right clicking a zone. You can also de-zone zones with buildings in them. Existing buildings will quickly disappear and gradually be replaced with buildings of the new zone type. In order to replace a pre-existing zone with a new zone you must de-zone first. It is not necessary to wait for the buildings to disappear before zoning a new type of zone. Commercial specialization is a feature added in the After Dark expansion which enables a focused use of commercial zoning. In addition to the already available shops which are listed as generic, commercial zones can be set as either Tourism or Leisure zones. Tourist zones are, as the name suggests, targeted at visitors to the city whereas Leisure zones are aimed at both visitors and residents. Both styles have unique buildings with hotels prevalent in tourism and theatres more common in leisure. Green Cities adds the "Organic and Local Produce" specialization, which produces 50% of sold goods locally, reducing truck traffic in the area. Garbage production is also reduced in the zone. The negative impact is an increase in electricity consumption. When an empty area is assigned a zone type, buildings gradually start to fill it. There are buildings of various sizes and they will have an appearance based on the zone type they are built on. You can select individual buildings and see information about them and their residents. Building information will vary based on the building type. Buildings will upgrade to the next level when the factors listed below are high enough. Note that services do not directly affect residential or commercial building levels, but they do have an indirect effect by raising land value. This table shows the relative weight of each service contributing to the service coverage score for industrial and office buildings. These values are not absolute, as they are further modified by the strength of the service, they merely serve to show the relative importance of each service in contributing to the building level. The strength of the service at any given location is generally determined by the distance via roads between the building and the service provider, and the budget setting. Therefore a very low budget setting for a service has a very large effect on its related service coverage score factor, potentially nullifying any advantage. This may prevent nearby buildings from leveling up as expected. Taking industry as an example, cargo transport is twice as valuable as fire coverage, and five times as valuable as police coverage (assuming the service coverage strength is the same). It is also useful to realize that ground and noise pollution have a small negative effect on industrial building level. This page was last edited on 12 March 2019, at 16:01.